We set an alarm for 7:30 am. Getting dressed, we headed into the old city center for breakfast. We had a hard time finding a place for breakfast. We wandered back and forth before finally just settling on a Starbucks! Finding a place for breakfast is a struggle that we occasionally have when we are traveling. Every culture deals with breakfast slightly differently and sometimes we just can't find the right rhythm to get in sync. After breakfast, using the Rick Steve's book, Jack led us on a great walking tour of the old city. We toured the Salzburg Cathedral, St. Peter Cemetery's and St. Peter's Church. The old city, including the cathedral, have some very Italian influences. In the cemetery, we climbed up into the cliff to tour some hillside caves where the medieval monks had lived. 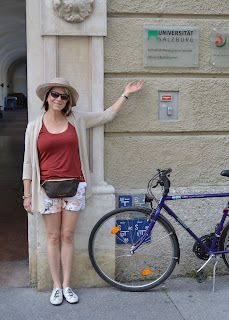 Along the walking tour, we stopped at the University of Salzburg. In the summer of 1985, Sharon spent six weeks taking classes here between her second and third year of law school. After 31 years, Sharon was excited to have a chance to come back! After a quick stop at the hotel, we headed to the Mirabell Gardens. We wandered through the gardens. Next, we went looking for Hotel Amedus. 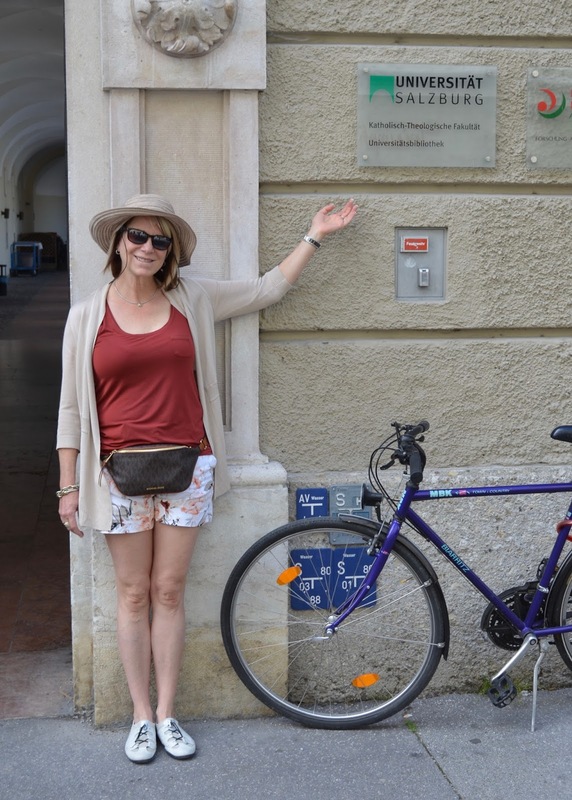 When Sharon came to Salzburg in 1985, she got there a couple of days before the dorms were open. Wandering in the city, she ended up staying a couple of nights at the Hotel Amedus. She has some very fond memories of her stay there and the view of the church cemetery out the windows. From here, we headed to the Museum of Modern Art. Located on a cliff overlooking the city, we took an elevator up to the museum. The plan was to have lunch there. The museum restaurant has some fantastic views. All of three of us had a business special (soup and risotto). Sharon has been talking for weeks about special desert that they have in Salzburg. We didn't get it on the first night. With our schedule, this was our only chance to order the desert. Sharon ordered the Salzburg Nockerl. It was huge. Continuing to feel under the weather, I wandered back to the hotel to take a nap. Sharon and Jack explored the ridge above the city. When they got back to hotel, we got cleaned up and dressed up a little. Sharon had made a package of reservations for the rest of the day that included four parts. First, we took a boat tour on the Satz River. We sat on the river and had a cold drink while we waited for the tour. We caught the boat on the river right across from our hotel. The boat tour lasted about an hour. Second, when the boat tour was done, we walked across the old city and took a funicular train up into the fort. It is literally a 30 second ride. 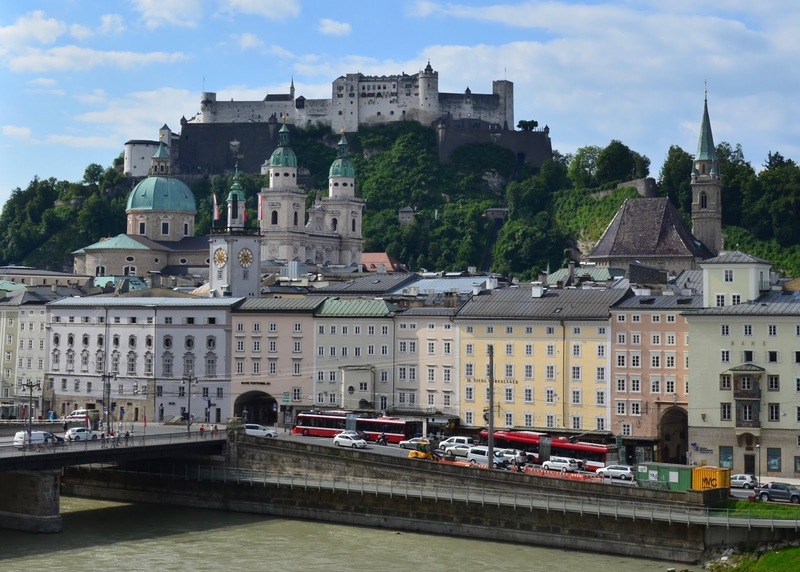 Third, we had dinner in the restaurant on the far side of the Hohensalzburg Fortress. While the food was mediocre, the views were stunning. There was a fixed meal; Sharon and I had a fish plate, while Jack had veal. Fourth, after dinner, we went up to the top of the fortress (the high floor of windows in the picture at the top of this post) and listened to an hour and a half concert that included Mozart and other composers.